Never has a delivery brought out such high volume, stereo screeching from the teen and I as the one that arrived recently from Urban Decay. Look, it’s all the Naked palettes, right there in one box. One glance at this and you’ll feel like having a sit down yourself. Where to start with that lot? 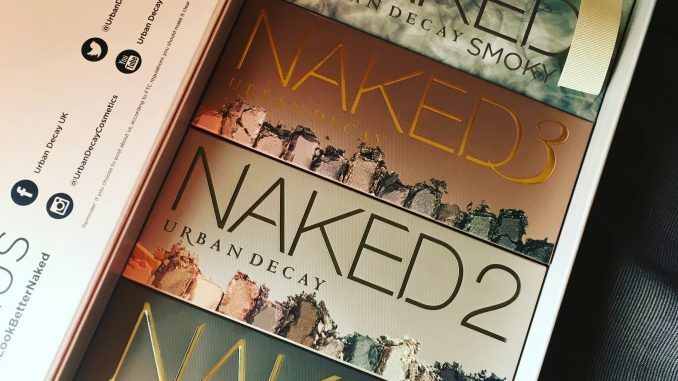 We thought it might be useful to consider the question – Which Urban Decay Naked palette is right for you? Whilst there are those who collect every palette, I suspect they’re in the minority. For most people, at around £40 this is a beauty purchase you’ll make once, maybe twice at a pinch. And I’ve no doubt you’ll want to put some thought into it. So let’s go through each one in turn, looking at the colours and the USP of each. 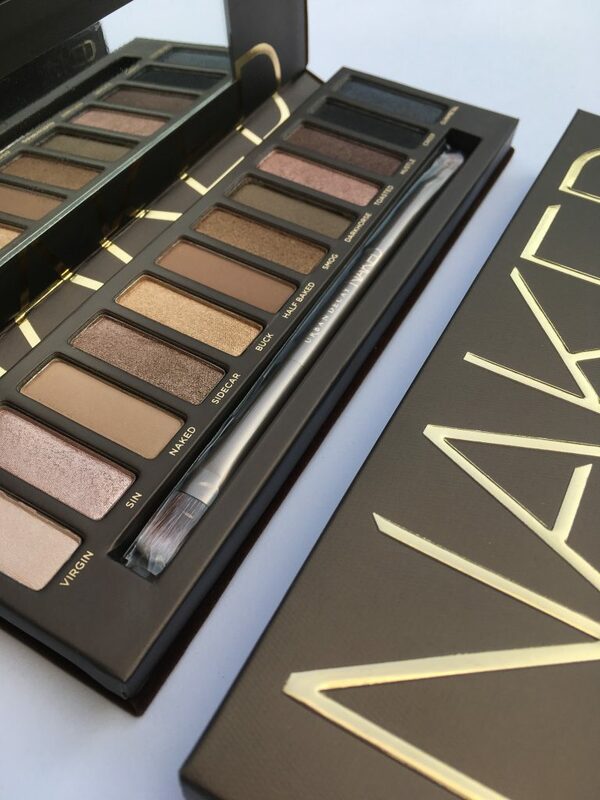 Urban Decay Naked palettes are designed so that every shade is useful, regardless of your colouring or age. At £39.50, price wise I don’t think it’s over the top, since you get 12 shades and who ever completely uses up an eye shadow palette? All come with an integral mirror and a double ended brush that’s slightly fatter at one end to help with blending. The shades are all designed to work together. They’re great for beginners since you can’t really go wrong. Whatever combination of colours you smoosh around your eyelids will work. As well as the four you see here, there’s also a Naked Heat palette featuring warmer tones, which I’ve reviewed over here. Though released in 2010, the original Naked palette still feels bang up to date. These shades are generally thought to work best on warm skin tones. There are more sparkly shades in this palette than in some of the later ones. But when I say sparkly, I’m talking about a beautiful golden sheen on the skin rather than full on glitter sparkle princess. It’s sparkly but still very wearable. But if what you want is matte then this isn’t the Naked palette for you. If I was being super picky about this, the mirror on this palette is smaller than the others, and the brushed velvet exterior is less fancy than the tin packaging of the other models. Another difference I’ve noticed is that the later Naked palettes seem more pigmented than the first one. This isn’t necessarily a bad thing, since you may prefer a lighter touch. If you want something reliable that you can throw at your face in the morning and trust it to stay there all day, this is it. Classics endure for a reason. 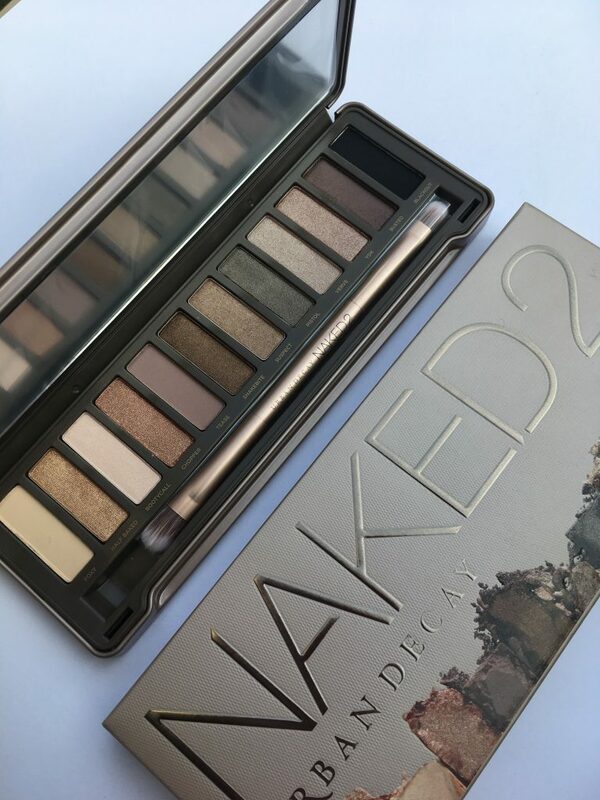 As Original Naked is for warm skin, the follow up Naked 2 is for cool skin. It contains 12 cooler toned neutral shades: 8 shimmers, 3 mattes and 1 micro glitter. This is the palette I’m turning to most often, along with the Naked Heat palette. How do you know if your skin is warm or cool? Look at the inside of your wrists. Do your veins look blue or purple? Then you’re cool-toned (that’s me, I’m like a frickin’ ice box). If your veins seem more like green, you’re warm-toned. If you can’t tell the difference then your undertones are neutral. At the two ends of the spectrum, the highlighter in Naked 2 is brighter than the first palette, and the darkest shade is so dark they named it Blackout. If Original is, broadly speaking for work (plus going out), I think Naked 2 is more suited for going out (plus work). So think about how you’d use your palette when deciding which one to go for. This rose gold themed palette looks the prettiest in the box, but can prove to be the most challenging to wear. Not everybody suits pink eye shadow, though it’s a good choice if you have very fair skin. If you’re after a natural look, this is the one for you. It’s got slightly more shimmers than mattes, and way more lighter tones than darks. Naked 3 has the most variety in terms of texture. There are 2 mattes, 1 is matte-satin, 1 is matte with sparkle, 3 are satins, 2 shimmers, 2 metallic micro-glitters and 1 metallic with micro-sparkle. That’s a whole lotta bling for your eyelids. And this is the one to go for if the look you’re after is more of the goth persuasion. 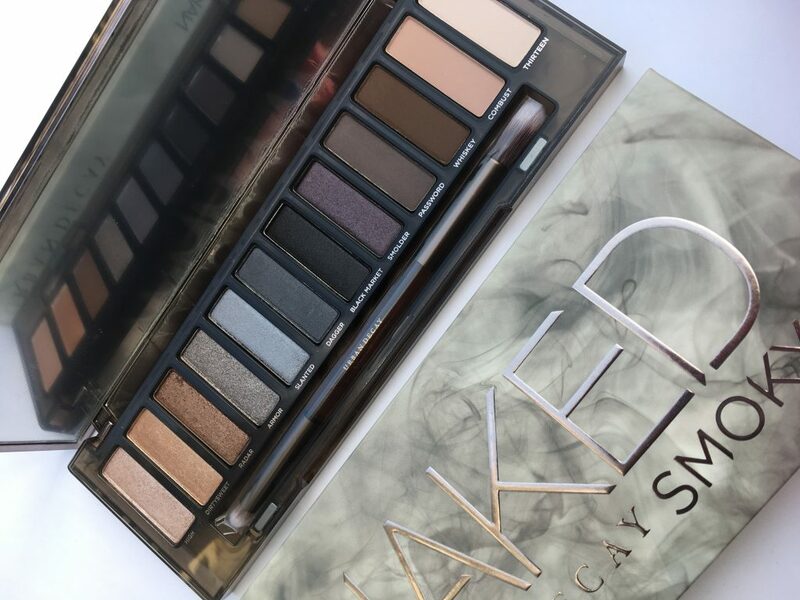 Naked Smoky literally does what it says on the tin, with a range of greys, blacks and browns designed to stand out. So if Original = staying safe, Smoky = edgy. Nine of the shades are new and exclusive to the palette, whilst the other 3 are repeats. There are rumours that Smoky is to be discontinued, after it was spotted on deep discount in the US, but so far it’s still for sale in the UK. Hope it’s not going. I like the packaging on this palette the best – all those smoky swirls and embossed pewter lettering. This or Naked 3 are the best ones to give as a gift, I think. 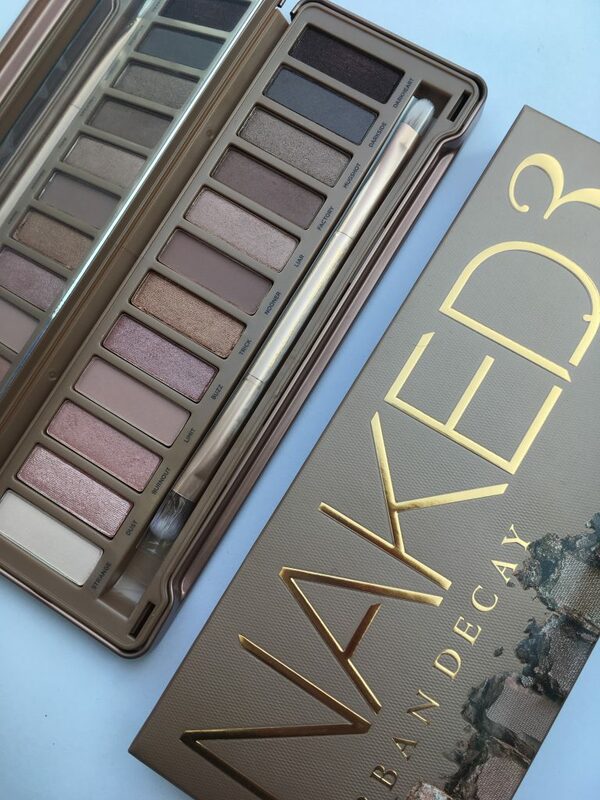 The Urban Decay Naked palettes are widely available in stores and online, RRP £39.50. Find out more from the Urban Decay website here.